The ward of Cripplegate straddles the former line of the Wall and the old gate, and remains divided into "Within" and "Without" parts, with a beadle and a deputy (alderman) appointed for each part. Since the 1994 (City) and 2003 (ward) boundary changes, most of the ward is Without, with the ward of Bassishaw having expanded considerably into the Within area. An illustration of the gate, c. 1650. In 1068, a burial site in Cripplegate, where Jewin Street now stands, was the only place in England where Jews were permitted to be buried. Those living elsewhere in the country were forced, at great expense and inconvenience, to bring their dead there. In 1555, John Gresham endowed the new Gresham's School in Norfolk with three tenements in the parish of St. Giles Without Cripplegate, including 'The White Hind' and 'The Peacock'. During the Second World War the Cripplegate area, a centre of the rag trade, was virtually destroyed and by 1951 the resident population of the City stood at only 5,324, of whom 48 lived in Cripplegate. Discussions began in 1952 about the future of the area, and the decision to build new residential properties was taken by the Court of Common Council on 19 September 1957. The area was reopened as the Barbican Estate in 1969. Following a boundary change in 1994, the Golden Lane Estate was transferred from Islington to the City, and so Cripplegate is today the most populous of the four residential wards of the City, with a population of 2,782 (2011). The origins of the gate's name are unclear. One theory, bolstered by a mentioning of the gate in the fourth law code of Æthelred the Unready and a charter of William the Conqueror from 1068 under the name "Crepelgate", is that it is named for the Anglo-Saxon word crepel, meaning for a covered or underground passageway. Another unsubstantiated theory suggests it is named after of the cripples who used to beg there. The name of the nearby medieval church of St Giles-without-Cripplegate lends credence to this suggestion as Saint Giles is the patron saint of cripples and lepers. Cripplegate is one of the 25 ancient wards of the City of London, each electing an alderman to the Court of Aldermen and commoners (the City equivalent of a councillor) to the Court of Common Council of the City of London Corporation. Only electors who are Freemen of the City are eligible to stand. In the early 12th century, the area was originally referred to as Alwoldii which was probably the name of the current alderman. The early records are unreliable as regards who the Aldermen were, but from 1286 there is a more reliable list of Aldermen available. 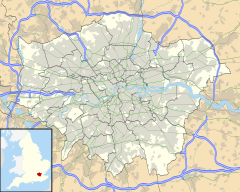 The modern City of London spreads across a square mile of land and remains divided into 25 geographic areas, or 'Wards'. Four of these Wards (Aldersgate, Portsoken, Queenhithe and Cripplegate), are described as 'Residential' as they contain the vast majority of all City residents. The Ward of Cripplegate provides part of the Northern edge of the City and stretches from just below Old Street, down to London Wall at its Southern tip, where it meets the Ward of Bassishaw. To the West is the Ward of Aldersgate and on the Eastern edge is Coleman Street. The 2003 Ward Boundary Review recommended some significant changes for a number of Wards and these were eventually implemented in 2013. 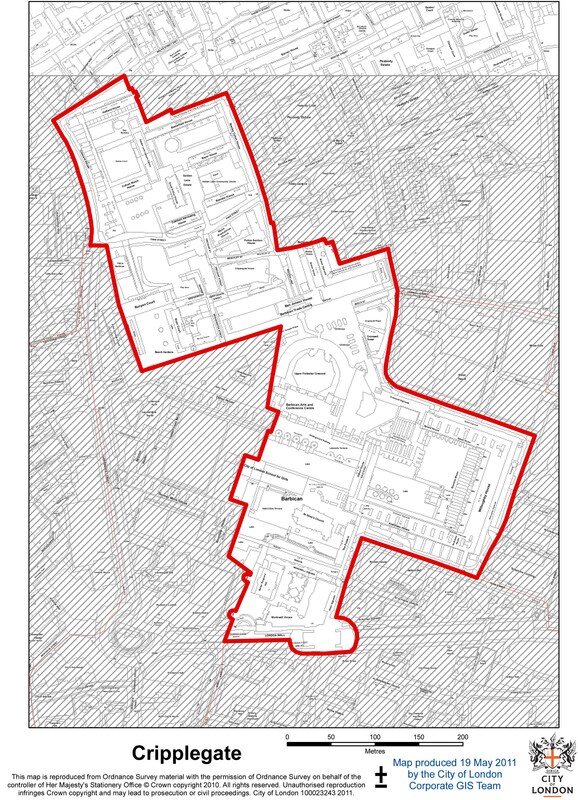 The Cripplegate Ward boundary used to extend a great deal further South, all the way down to Cheapside in fact. The Ward was home to the Livery Halls of 6 Worshipful Companies and now only one remains (The Barber-Surgeons in Monkwell Square). Each Ward is represented by an assembly called the 'Court of Common Council'. This consists of 100 Common Councilmen and 25 Alderman (one for each Ward). The number of Councilmen allocated to each particular Ward is based on the size of the electorate and where Cripplegate used to warrant 12 members of Council it is now reduced to 9. The Ward is promoted by the Cripplegate Ward Club. Founded in 1878, The Cripplegate Ward Club is a social organisation, encouraging its members to take an interest in the Civic affairs of the City, while also supporting appeals and charitable activities. Cripplegate is among the busiest of the 20+ Ward Clubs in the City of London, with a varied programme of events throughout the year. Further information about the Cripplegate Ward Club and the history of Cripplegate can be found on their website. Current elected representatives in Cripplegate are David Graves (Alderman), Mark Bostock, David Bradshaw, Mary Durcan, Vivienne Littlechild, Susan Pearson, William Pimlott, Stephen Quilter and John Tomlinson. In the 2017 City-wide Common Council elections, the Labour Party won two seats in Cripplegate ward with local residents Mary Durcan and William Pimlott making Labour gains. The Labour Party won a record total of five seats on the Common Council in March 2017 winning two seats in Portsoken, two seats in Cripplegate ward and one seat in Aldersgate ward. The foundation dates its origins to the donation of £40 "to provide trousers for local people" on 2nd April 1500. However it was only in 1891 that various local trusts were consolidated into the Cripplegate Foundation by the London Parochial Charities Act. Between 1896 and 1973 the foundation ran the Cripplegate Institute. From 1 April 2008 the area of benefit was expanded to include Islington. John Gilbert is the chair of the foundation, having been on the board of governors since 2005. The Cripplegate Savings Bank was established in 1819 as a joint stock bank, then re-registered as Cripplegate Bank Ltd in 1879, and finally renamed London, Commercial & Cripplegate Bank Ltd in 1900. In between 1876-1906 the Cripplegate Bank was located at 31 and then 1 Whitecross Street, before been incorporated into the Union Bank of London, and finally been liquidated. It was located at 6-9 Bridgewater Square, in a Georgian building with 60 rooms available, not far from today’s Beech Street, before being destroyed by the World War II bombs. It was advertised on a number of periodical and magazines in between 1887 and 1919 as a very centrally located, family and commercial temperance friendly hotel, convenient for St Paul’s Cathedral, Aldersgate station for business and pleasure. The second wedding in the film Four Weddings and a Funeral takes place in the fictional church of St. Mary of the Fields, Cripplegate, EC2 It was filmed in the chapel of the Royal Naval College, Greenwich. ^ A-Z London. Geographer's A-Z Map Co Ltd. 2001. p. 162. ISBN 0-85039-753-7. ^ Tom Bolton (24 June 2015). "From Cripplegate to Agar Town: inside London's vanished neighbourhoods". The Guardian. Retrieved 24 June 2015. by the second world war, Cripplegate had become "Fire Island", the highest-insurance-risk area in London, occupied by rag trade warehouses packed with tinder-box stock. ^ Harben, Henry (1918). A Dictionary of London. London. ^ a b c d "History". www.cripplegate.org. Cripplegate Foundation Limited. Retrieved 8 December 2017. ^ Sic : Cripplegate is in the EC3 postcode area. Wikimedia Commons has media related to Cripplegate Institute.